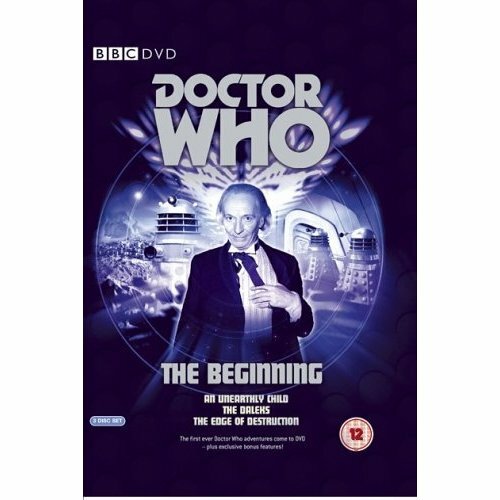 3 DVD Disc Set including the first ever Doctor Who serials “An Unearthly Child”, “The Daleks” and “The Edge of Destruction”. 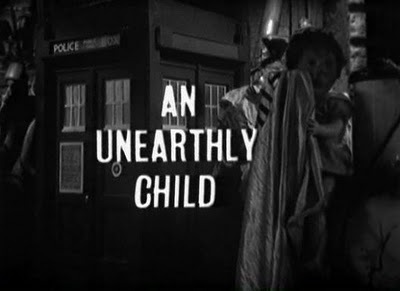 “An Unearthly Child”. The first ever Doctor Who serial broadcast between 23 November and 14 December 1963. Those with even a cursory knowledge of the history of Doctor Who will invariably be aware that An Unearthly Child was the first Doctor Who serial ever screened on (British) television. Broadcast on 23 November 1963 , An Unearthly Child is in reality the name of the first of four 25 minute episodes that constituted the first Doctor Who story, or “serial”. Prior to The Savages, which was aired from 30 April 1966, all episodes in a serial had a unique name but no collective serial title. It was only in later years that an overriding serial title was assigned to these earlier individually named episodes which constituted a single story. What is now known as An Unearthly Child was broadcast in four episodes entitled “An Unearthly Child”, “Cave of Skulls”, “The Forest of Fear”, and “The Firemaker”. The opening credits to “An Unearthly Child”. Unsurprisingly, it is in this serial that we first meet The Doctor, together with his three companions, Susan Foreman, Ian Chesterton and Barbara Wright. Although the viewer is soon appraised of the fact that The Doctor is not from our planet, the earth, the location of his home is not disclosed for a number of years. Nor is The Doctor identified as a Time Lord who has two hearts and is capable of regeneration in the event of serious injury or impending death. Our soon to be hero’s Gallifreyan heritage and unique physical characteristics are traits that have yet to be invented by the programme’s writers. 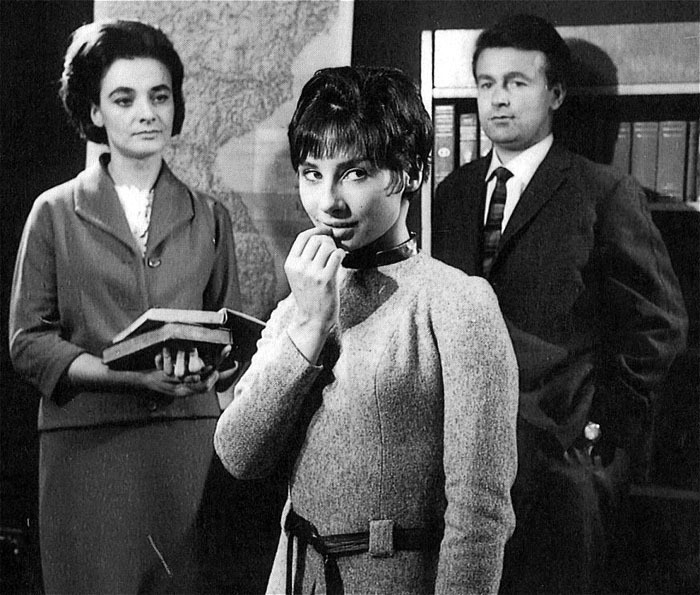 The Doctor’s grand-daughter Susan, with her History Teacher, Barbara Wright and Science Teacher, Ian Chesterton. Instead, we meet a seemingly elderly man who is at best a little crotchety, and at worst devoid of any vestiges of morality. The Doctor is not the hero that he is to soon become, but rather an alien being, in the physical form of a human, whose actions are profoundly egocentric. Accompanying him to 1963 London is his 15 year old grand-daughter, Susan, who against the Doctor’s express desires enrolls in a local comprehensive secondary school, Coal Hill School. Just why an alien teenager would attend school is never explained, although one might posit that Susan was keen to escape from her grandfather’s control and experience a settled and ordinary “human” existence. Susan intrigues her teachers by being absolutely brilliant at some things and excruciatingly bad at others. Home for the Doctor and Susan during their earthly sojourn is an apparently abandoned Scrap Metal Merchant’s yard. The gate to the yard bears a sign reading “IM Foreman Scrap Metal Merchant”. Mr Foreman’s whereabouts, and the circumstances in which the Doctor and Susan took up residence there, is not revealed. Amongst the junk that has accumulated in premises is a blue Police Box. A common sight in 1960s London, these Police Boxes were used by the local constabulary to make telephone calls back to their Police Stations and to temporarily hold arrested persons. This box, however, is no ordinary Police Box but the Doctor’s spaceship which Susan named the Tardis, an acronym for “Time and Relative Dimensions in Space”. Bigger on the inside than out, the Tardis is capable of travelling through time and space. The Doctor’s earthly home, 76 Totters Lane. Concerned by the diminishing standard of Susan’s homework, two of her teachers, Barbara Wright and Ian Chesterton resolved to visit her home and speak to Susan’s grandfather. Barbara teaches history and Ian teaches Science. Following Susan home one evening, Ian and Barbara see Susan enter the Scrap Metal yard and discreetly follow her in. Once inside the yard the teachers are unable to find where Susan has gone and investigate the premises. Confronted by the Doctor, who sneaks out of the darkness, the teacher detectives identify themselves and seek information on Susan’s whereabouts. 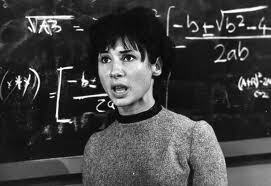 The Doctor is arrogant and dismissive of the teachers’ questions and denies that Susan has entered the yard. A noise from inside the Tardis, however, alerts Ian and Barbara to Susan’s presence. They gain entry into the Tardis and are dumbfounded by what appears to be an optical illusion. Notwithstanding the evidence Barbara and Ian aren’t convinced that the Doctor and Susan are from another time and world. Angry at having strangers barge their way into his spaceship, the Doctor contemplates the problems that this may cause. Prior to being able to act upon his desire not to release the pair, a scuffle occurs and the Tardis accidentally starts. Ian and Barbara pass out as we hear the now distinctive sound of the Tardis materializing. Like it or not, the teachers are now unwilling companions of the Doctor and Susan as they begin their travels in time and space. The Tardis materializes for the first time. It has not been infrequently stated that the following three episodes of this story are nothing more than cavemen running around talking and fighting about fire. Whilst fire is indeed the principal topic of the remainder of the serial it is by no means quite so simple. 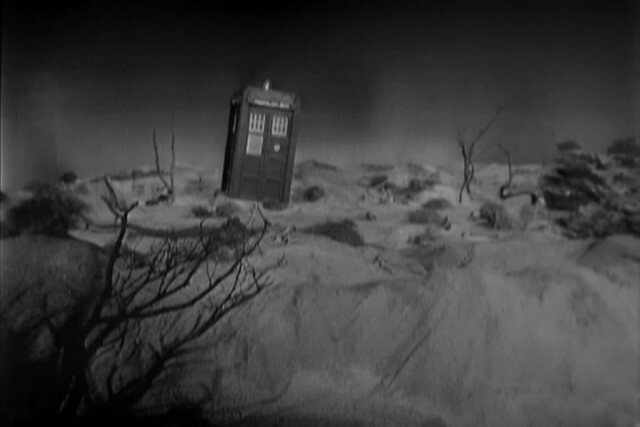 The Tardis lands in a deserted location which the viewer soon learns is in pre-historic times. The land is inhabited by a tribe of cavemen who have lost their knowledge of how to make fire. The previous leader of the tribe died without imparting the tribe with this essential knowledge and as a consequence their continued existence is threatened. Whilst investigating the strange box which is inhabiting their landscape, the cavemen come upon the Doctor who, for the first and last time in Doctor Who, is seen to be smoking. The cavemen are intrigued by the fire that is seemingly comes from the Doctor’s fingers as he lights his pipe. The smoke he exhales is further evidence to these pre-historic men that the doctor is possessed of unique powers that permit him to make fire. The Doctor’s ability to make fire is needed by the tribe. The Doctor is kidnapped by the tribe and taken back to their cave home and is subsequently joined by the other three members of the Tardis crew. The Doctor is kidnapped for his smoking habit. The tribe’s subsequent internal battles for leadership and the Tardis team’s attempts to escape fill the following episodes. Although the desire to obtain, or not to obtain, fire is the pervasive theme, nonetheless important character development and moral messages are evident. In a society seemingly without reason and logic, the leader of the caveman tribe is young and strong – a person who can make fire and can also collect meat. The presumption by the cavemen that the “old” and therefore presumably physically weak cannot be leaders causes friction amongst the Doctor’s party when the tribe mistakes Ian as the leader. It is with surprise, therefore, that Ian corrects this misapprehension and nominates the Doctor as their leader. For all intents and purposes it is Ian that displays the qualities of leadership. 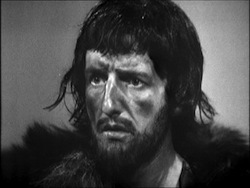 Whereas the cave men settle their leadership disputes with clubs and brawn, the Tardis Tribe leadership is determined by a battle of words and the deferential respect for the aged. Sexual politics, however, appears to have changed little from cavemen time to 1963. Susan, whose power was evident in her otherworldliness in Part 1, has been reduced to a screaming child. The intelligence, and indeed genius, that Ian identified at Coal Hill School is little evident. Susan’s principal contribution to the last 3 parts was the discovery that skulls became illuminated when placed upon a burning stick. For an unearthly child, she certainly seems less than alien, and profoundly human, when compelled to confront the stark realities of time travel. This is very interesting. I haven’t seen any Classic Who yet, but you do a great job explaining it. I like how you follow the story, but also commentate on the different issues presented in the storyline. I look forward to reading more posts! And your goal of watching all of the episodes in 50 weeks and blogging about it is impressive. Thanks for your response, Rachel. Enjoy your journey into Doctor Who! I guess this box set doesn’t contain the unaired pilot episode. I only figured out the other day that I had it. The differences are interesting, but subtle, so I hadn’t noticed. It was released (at least a version of it, I’ve had trouble working out exactly the details) on the Hartnell Years video, with comparison clips and an explanation from Sylvester McCoy. Maybe it came out on DVD too, or another DVD. The most interesting differences to me are that the Doctor does appear to be wearing a suit and tie, and that Susan draws a Russell T. Davies-styleTime Lord language hexagonal character! The unaired pilot is actually on this box set and the first episode shown. Like you, I didn’t realize for quite some time. When the broadcast version played I assumed that the DVD player was stuffing up and I’d skip it 🙂 The special feature that you refer to here, with the explanation from McCoy, isn’t on the DVD box set. I’d be interested to see that one. 🙂 I do have 2 questions for you if you don’t mind. come back very soon. I want to encourage you to ultimately continue your great posts, have a nice weekend! I am really impfessed with your writing skills as well as with the layout on your blog. Is this a paid theme or did you modiify it yourself? Thanks for your kind comments Stevie. I am using a standard WordPress layout which I selected from their free range. I do, however, pay a yearly subscription for the web address, doctorwhomindrobber.com. I don’t even know the way I stopped up right here, however I thought this post was good.